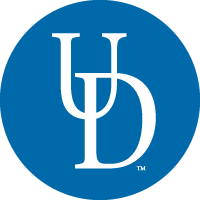 Mrs. Emily C. Diffenback of Wilmington, Delaware, an alumnus and former president of the Delaware Federation of Garden Clubs, first donated the funds to establish and maintain gardens around the University of Delaware’s campus in 1966. Drs. Charles W. Dunham and Richard W. Lighty, professors of plant science, desired to create a garden and arboretum that would be beneficial to the entire campus. The Emily B. Clark Garden was designed not only to be a place of great beauty and respite, but also to be used as a teaching tool to educate undergraduate students in the College of Agricultural Sciences and graduate students in the newly established Longwood Program in Ornamental Horticulture. Drs. Dunham and Lighty selected the most ornamental examples of plants within each plant group. Plant donations, such as the large paper bark maple (Acer griseum) from Millcreek Nursery (the former nursery of Mr. and Mrs. William H. Frederick, Jr.), laid the foundation for an extensive woody plant collection. A collection of hollies was established with the intention of getting the University of Delaware officially recognized as a Holly Arboretum. The Emily B. Clark Garden was built using recycled soil from the excavation site of Wolf Hall, previously referred to as “the knoll” on campus. The soil was formed into one large mound and several smaller mounds. A low retaining stone wall was created and runs most of the garden’s length. The Emily B. Clark Garden was formally dedicated in May 1973. Some of the plants in this garden are the most mature specimens in the University of Delaware Botanic Gardens. Other notable specimens include California incense cedar (Calocedrus decurrens), Magnolia (Magnolia x loebneri ‘Leonard Messel’), and golden larch (Pseudolarix amabilis). This garden features a diverse collection of ornamental conifers, interspersed with deciduous flowering shrubs and trees and broadleaved evergreen plants which provide ornamental interest throughout the year.